They say that the history of carpentry is as old as time itself. This free online carpentry course will give you an solid introduction to carpentry, overview carpentry as a trade, guide you through the main carpentry employment opportunities and apprenticeship programs, materials and tools, construction methods, plans and drawings, and much more. This will open the door to a great hobby, or even a profitable career for the future. This Diploma course will first cover the current practices of carpentry and joinery. You will also learn the history of the carpentry trade from primitive to modern times. You will then learn about the most important building materials, fasteners, and adhesives used by carpenters in the construction industry, and get an overview of different carpentry tools and their uses. The course will also cover carpentry apprentice jobs and employment opportunities in the construction industry as well as discuss the safety guidelines and procedures in carpentry. Next, you will study how to read carpentry and construction plans and elevations, and learn the methodologies for constructing the flooring system. You will learn how to lay out, assemble, and erect wooden frame walls and roof frames. You will study the concrete forms used in construction and the installation of windows and exterior doors in residential projects. The course also covers the requirements for framing stairs including layout techniques, and the work involved in closing off a structure. 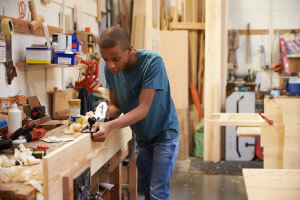 Learning an age-old and highly skilled trade like carpentry will keep you in high demand in the construction industry. This Diploma course will be of great interest to all learners who want to further develop their career in carpentry and the construction trade, and also to those who want to learn an incredibly useful trade for personal use. So, check out the course and gain a sound knowledge of the tools, materials, and building methods in carpentry today! Having completed this course the learner will be able to: - Describe the history and scope of carpentry as a trade; - Identify the opportunities for carpenters in the construction industry; - Classify the various building materials used by carpenters; - List the most commonly used fasteners and adhesives used by people in the carpentry trade; - Explain the different types of hand and power tools available to carpenters; - Outline the general safety procedures and guidelines that should be followed to operate the tools; - Discuss the importance of employee responsibility and human relations to being successful in the trade; - Identify the various types of construction drawings that make a drawing set; - State the guidelines to read and interpret reading plans and drawings, blueprints, and specifications; - List the various terms associated with floor systems, wall, ceiling and roof framing; - Explain the different methods of framing and constructing houses made of wood; - Describe the types of beams/girders and supports used in construction; - Outline the sequence involved in constructing a platform floor assembly; - Summarize the basic procedure for laying out, assembling, and erecting wood frame walls; - Recognize the different types of roofs used in residential construction; - Determine the length of a common rafter required to construct a roof; - Discuss the terms associated with concrete, concrete reinforcing materials, and formwork; - Apply the concrete mixing information to get different types of concrete, designed to suit various purposes; - Explain the basic concrete curing methods and materials; - List the various components of windows, exterior doors, and stairways used in residential construction; - Summarize the basic installation procedure for pre-hung windows; - State the various types of exterior doors used in residential construction; - Identify the essential requirements for framing stairs; - Describe the design and layout techniques used for stairways and stairwells.